Rory McIlroy made an honest assessment of his Masters campaign and confessed It’s the silly mistakes that have cost him. 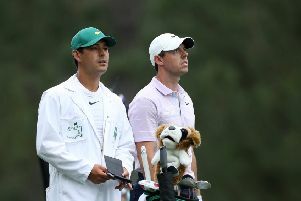 The Holywood man goes into Sunday’s final round at Augusta on one under and tied-39th, after shooting a 71 yesterday. It was his second successive day breaking par - but it wasn’t enough to see him make an impression on the leaderboard, which has Open champion Francesco Molinari sitting at the summit on 13 under. Not for the first time this week, McIlroy’s latest round had everything. An eagle at 15, birdies at four, 10, 13 and 16 - but most tellingly bogeys at six, seven, nine, 11 and 18. It made for another day of inconsistent scoring, with the 29-year-old unable to gain any momentum. And while the four-time major winner is adamant he’s not playing badly ahead of his 12.52pm tee-off time from the 10th hole in the company of Keegan Bradley and Gary Woodland (both one under par), he conceded the mistakes he’s made this week have ultimately cost him. All groups have had their start times for today’s final round brought forward because of the possibility of severe weather over the Augusta course in the afternoon. 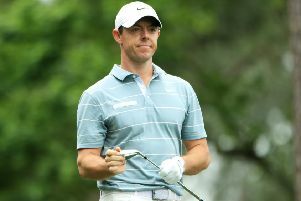 ‘It’s not as if I’m playing bad golf,’ said McIlroy. ‘I’m under par for the golf tournament, but I’m just not enough under par. ‘I just made too many mistakes, I guess. ‘Missing the green left on six, the par three, for instance. ‘I then put myself out of position on a couple of the par fives, where I can’t go for the green in two. ‘Just little things like that where a different day could be a different result. McIlroy, who recorded top-10 finishes in his five most recent Masters outings, sits 12 off the lead going into today’s finale. It’s too far back to consider a late challenge. Yet the Northern Irishman is hopefully of finishing the week on a high. ‘I don’t know what’s going to happen,’ added McIlroy. ‘I mean, Tony Finau shot six‑under on the front nine on Saturday. ‘I’m going to need something like that to maybe have a chance.